Fox Sports Asia has selected its team of the tournament from the recently-concluded Asian Games 2018 (ASIAD), and three Vietnamese players have made the line-up. They are right back Vũ Văn Thanh, centre back Bùi Tiến Dũng and central midfielder Nguyễn Quang Hải. Widely regarded as one of Southeast Asian’s brightest prospects following some brilliant displays as an attacker, Hải’s development continued at the Asian Games as he was deployed in a traditional central midfield role. He not only adapted well to an unfamiliar role but even outperformed Việt Nam’s usual midfield general Lương Xuân Trường, although his campaign ended on a sour note as he missed a costly penalty in the bronze medal playoff against the United Arab Emirates. 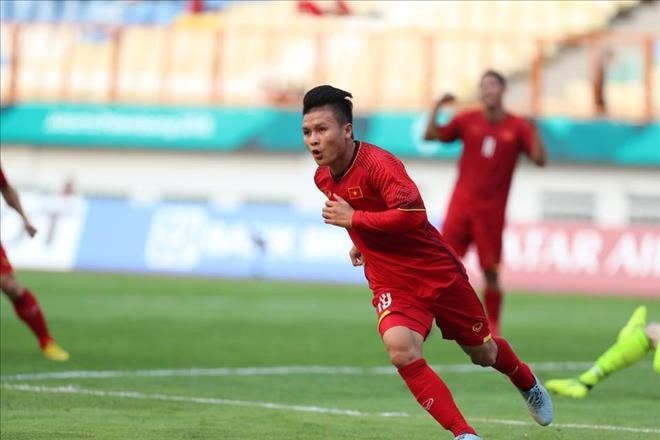 Meanwhile, having already been a star in January’s AFC U-23 Championship, Thanh continued his excellent form in Indonesia as Việt Nam stormed to the semi-finals before being beaten by eventual winners South Korea. The 22-year-old looks a perfect fit for coach Park Hang-seo’s 5-2-3 system, bombing forward with intent whenever he gets the chance, but is also adept at performing his defensive duties. Talking about Dũng, the website said that while it was Bùi Tiến Dũng – the goalkeeper – who shone for Việt Nam back at the AFC U-23 Championship, it was Bùi Tiến Dũng – the centre back – who came to the fore this time around. The Viettel defender played a crucial role in his side, keeping five consecutive clean sheets from their opening Group D clashes until they conceded in the semi-finals to the South Koreans. Fox also named goalkeeper Mohamed Al-Shamsi of the United Arab Emirates, centre back Yugo Tatsuta of Japan, central midfidler Odiljon Xamrobekov of Uzbekistan, midfielder Lee Seung-woo of South Korea, and forwards Safawi Rasid of Malaysia, Yuto Iwasaki of Japan and Zabikhillo Urinboev of Uzbekistan in its team. In other news, more than 25,000 South Koreans have demanded referee Kim Dae-yong be banned following his poor performance in the bronze-medal match between Việt Nam and the UAE. They have posted a petition on the official website of President of South Korea Moon Jae-in, asking for the Korean referee not to be allowed to officiate international matches. The petition pointed to serious mistakes made by Kim during the match that were obvious to anyone with a basic knowledge of football. The petition will be online for supporters to sign until October 1. Many South Korean football fans said the referee had treated the Vietnamese players unfairly and denied them a clear penalty kick. The game eventually went straight to a penalty shootout after normal time ended 1-1, with Việt Nam suffering a 4-3 defeat in the shootout.